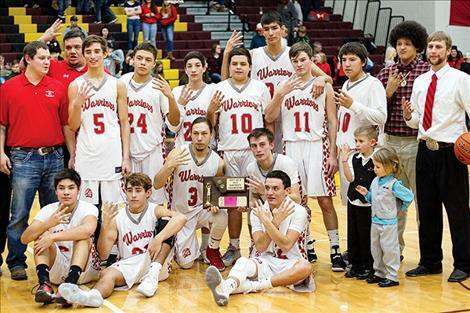 The Arlee Warriors are four-peat district champions. Arlee Warrior Will Mesteth slips past defenders for a score. 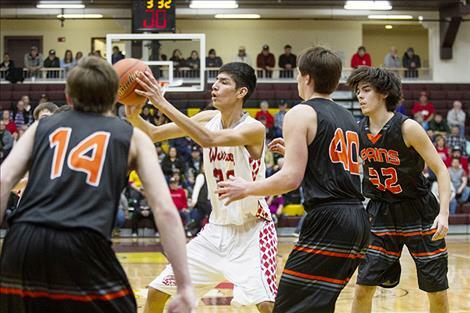 Arlee Warrior Isaac Fisher dishes the ball off to a teammate. Arlee’s head coach Zanen Pitts directs his offense. PABLO – As the Class C State Champions for last year, the Arlee Warriors officially began to defend their 2017 title by winning their remarkable fourth consecutive District 14C championship trophy Saturday evening at the Joe McDonald Health and Fitness Center on the Salish Kootenai College campus in Pablo. The undefeated Warriors opened the district tournament with a first-round bye as the number one seed. 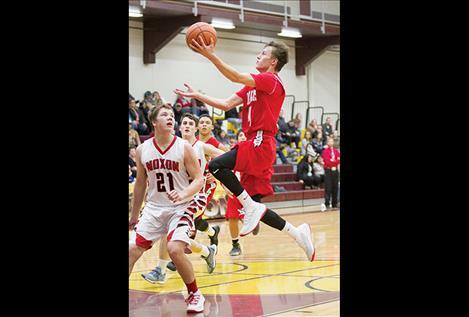 On Friday in the semifinal game, senior Phillip Malatare, who has over 1,500 points for his career, scored a game-high 24 points to lead the Warriors in a 64-42 victory over Noxon. 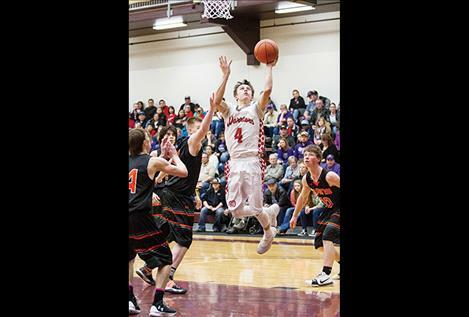 With the win over Noxon, the Warriors advanced to Saturday evenings district championship game against the Plains Horsemen. The Horsemen played a tough game in the first quarter and only trailed Arlee by six points at the end of the quarter, 26-20. The Warriors put the Horsemen away with a 22-7 second-quarter advantage and went on to post a 95-59 victory in the championship. Will Mesteth led the Warriors in scoring with a game-high of 26 points closely followed by Malatare at 25 points. 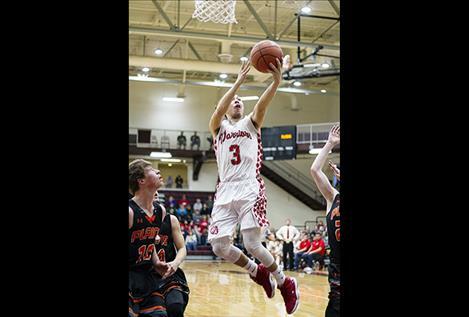 Lane Johnson added 13 points and Greg Whitesell chipped in another 12 points for the Warriors. 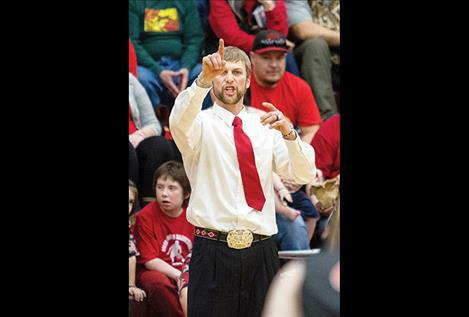 Coach Zanen Pitts’ group will set its sights on a third straight Western C championship next week in Hamilton. The Warriors will either face Darby or Clark Fork on Thursday at 1:30 p.m. to start the tournament. The Charlo Vikings slipped past Noxon 49-41 in the consolation final on Saturday afternoon earning a third-place finish. The Vikings were a strong opponent as they made their way through the brackets by defeating Hot Springs 61-27 on Thursday. They lost 50-33 to Plains during the semifinals on Friday, and then they went on to rebound Saturday morning 64-59 over Two Eagle River. The Vikings eventually took a win against Noxon. Landers Smith paced all Viking scorers during the three-day tournament with 68 points, while senior Tyson Petticrew, who eclipsed 1,000 points for his prep career, scored 65 points. Two Eagle River senior Brendan McDonald scored a game-high 20 points in the 61-55 loss to Noxon on Thursday, while Brandon Larios scored an Eagles team-high 16 points in the loser-out consolation game against Charlo on Saturday.